The World Soil Day (WSD) campaign aims to connect people with soils and raise awareness on their critical importance in our lives. The WSD 2016 has been celebrated on the 5th of December at FAO headquarters in Rome, FAO regional offices and through national and local events. Hundreds of initiatives took place in more than seventy countries worldwide, celebrating extraordinary stories about global soils. In celebration of the synergy between IYS 2015 and IYP 2016, the new book Soils & Pulses: Symbiosis for life was launched on the occasion of WSD 2016 at FAO Hq. This 114-page publication illustrates the various ways in which the "strategic alliance" between soils and pulses contributes to forging more sustainable food and agriculture systems, presenting decision-makers and practitioners with scientific facts and technical recommendations for managing the symbiosis between soils and pulses. It ultimately explores how sustainable practices can be implemented in support of the effort to end hunger and malnutrition, adapt to climate change, halt soil degradation and achieve overall sustainable development in view of the 2030 Agenda for Sustainable Development. A short video illustrating the symbiosis between Soils and Pulses was prepared and is available here. A series of 9 postcards focusing on the main soil threats have been produced together with a world map showing the condition and trend of each specific threat worldwide. The official World Soil Day logo is available for you to download and use to help the campaign at your event! Look out for more languages in the coming weeks! If you would like to request the logo in a new language, please send an email to GSP-Secretariat@fao.org. This series of 6 postcards provide the key messages drawn from the book 'Soils and pulses' which will be launched on the 5th December 2016. Why not adding the World Soil Day banner or button to your blog or your website ? We've provided a variety of sizes for you to download. The Sustainable Development Goals were recently created with a view to achieve sustainable development by 2030. Of the 17 goals, four contain targets specifically related to Soils. This animation looks at some of the challenges we face in each of these goals and presents some of the methods we can use to tackle them. Soils are by nature linked to the micronutrient content of our food production and they can help to reverse the increasing trend of nutrient depleted soil by adopting sustainable soil management practices. A look at how our Soils help to combat climate change in their role of sequestering CO2, and how our collective habits can damage this benefit with potentially devastating consequences. Soil 101 is an animated introduction on soils prepared in the framework of the 2015 International Year of Soils. This 2 minutes video outlines the main soil functions and the threats currently facing them. Do you need one of those videos in high definition to display at your World Soil Day event ? Just send us an email and we will share it with you. Soils are key to unlocking the potential of mitigating and adapting to a changing climate. Soils deliver 11 key ecosystem services that enable life on Earth. 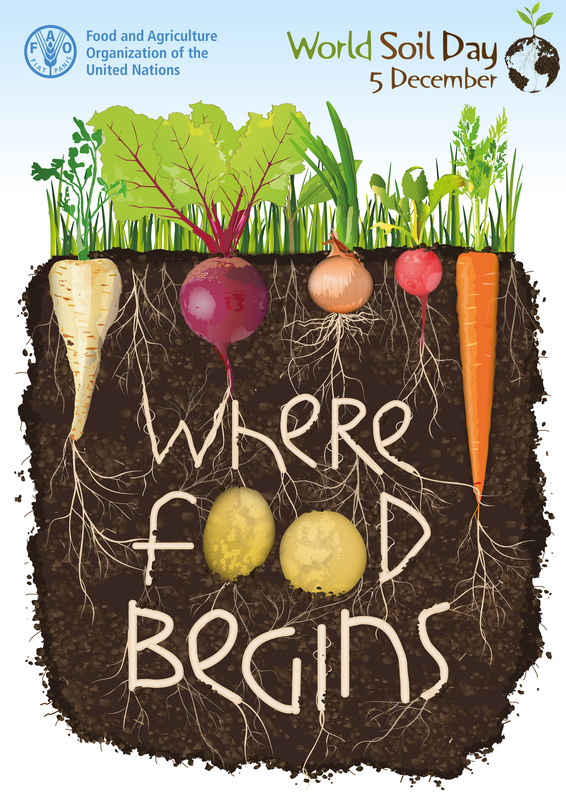 Soils are by nature linked to the micronutrient content of our food production. Sustainable soil management can help to reverse the increasing trend of nutrient depleted soil. Soils are under increasing pressure of intensification and competing uses for cropping, forestry, pasture and urbanization. These pressures combined with unsustainable land uses and management practices, as well as climate extremes, cause land degradation. Healthy soils not only are the foundation for food, fuel, fibre and medical products, but also are essential to our ecosystems, playing a key role in the carbon cycle, storing and filtering water, and improving resilience to floods and droughts.